This amazing ice cream cookie sandwich has no dairy and no added sugar. It contains just two simple, healthy ingredients that combine to make a delicious frozen treat. 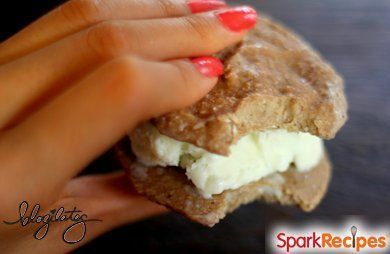 This amazing ice cream cookie sandwich has no dairy and no added sugar. It contains just two simple, healthy ingredients that combine to make a delicious frozen treat. Make sure to press the cookie "dough" flat onto the pan in exactly the shape you want it to end up. Watch recipe creator Cassey Ho demonstrate how quick and easy it is to make this recipe!